"13 Reasons Why," is a Netflix original series based on the novel by Jay Asher, that follows teenager Clay Jensen, in his quest to uncover the story behind his classmate and crush, Hannah, and her decision to end her life. 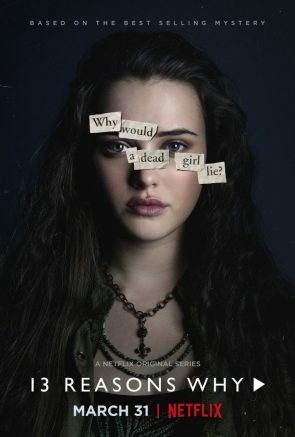 “13 Reasons Why,” a Netflix series based on the novel “13 Reasons Why” by Jay Asher published in 2007, is a story about a high school girl who leaves behind 13 cassette tapes for the people who led her to commit suicide. Now that’s some heavy clickbait. There is a lot to ruminate on once you’ve finished the season and as hyped up as it is I will be one of the people to say “13 Reasons” is not doing what it intended to. I believe its intentions were to shine light on teen suicide, the effects of bullying and the importance of having a strong support group. Instead I just ended up feeling resentment for Hannah. The tapes are nothing more than revenge recordings. Hannah points out to her abusers how they ruined her life. She doesn’t hold back in any sense of the phrase. Even Clay, the protagonist of the story and most clueless boy alive, is mentioned because he wasn’t there for her when she needed him most. He is left to believe that he killed her. That they all killed her. This doesn’t mean her abusers aren’t in the wrong. They definitely added to her depression. In truth they are in part why she took her own life but to put all of the blame on them seems selfish and downright cold. And yet they went against his better judgement. This is especially harmful to younger adolescents. It not only romanticizes suicide but Hannah’s last moments. It shows a way that they too could end their lives. “13 Reasons why” is well-done; the storytelling is dramatic and pulls kids in, while relating to them. That makes it more dangerous,” Reidenberg said. It gives too much validation for Hannah’s 13 reasons. It teaches its viewers that this is almost a justified and acceptable suicide. People who are experiencing similar problems that Hannah did may feel entitled to blame others entirely. Yes, bullies and abusers absolutely need to be held accountable, but it actually discourages the idea of getting help. It makes it seem OK when in reality Hannah needed to seek professional help. She could’ve been saved. There was still a chance for her. Also what’s up with the guys in the show (most of them) being absolutely abusive and yet hardly are those issues addressed? I mean for god’s sake we have characters who are traumatized because of varying degrees of sexual, emotional and psychological abuse. The women in the show are portrayed as helpless and lost. It doesn’t do any service to the capabilities that women possess. They are all damsels in distress. Hannah is extremely defensive. Given the mistreatment she receives it is understable but only to a point. She tells Clay on his tape that he should have stayed that, that is what she wanted. Yet he asks multiple times what is wrong and she literally screams at him to leave her alone. I’m assuming the show wanted to stress the importance of sticking around and making sure someone is OK. I can buy into that but only if it’s half off. My real concern here is that it shows Hannah doing the yes means no and no means yes thing. No means no. You have to communicate clearly with people. Expecting people to read your mind is such unhealthy behavior. Hopefully Hannah’s actions don’t empower its viewers who also speak in tongues. I’m 50/50 on this next one. Hannah gets very easily angry with Clay for not saying what she’d prefer to hear. Clay is awkward and he doesn’t do himself any favors by being so standoffish, when it’s clear he loves Hannah. With saying that Hannah is short-tempered and puts him down as soon as he responds with one of his dumb remarks. He is clueless and I understand how he unintentionally hurts Hannah. He really should’ve gone after what he wanted but Hannah is pretty hard on him and she fails to see that Clay isn’t a mind reader, he needs to be told what she wants. I wasn’t totally sold on the idea that everyone knew the poem published in the magazine was written by Hannah. It doesn’t seem realistic that everyone would be so interested in poetry and that a teacher would read it aloud, especially considering it wasn’t an actual school publication. But I understand everything was dramatized to show how it feels when you’ve been publically humiliated. It added to Hannah’s isolation but it also strayed from something more believable. Kinda going off of the last issue I think the show intended to convey just how bad bullying can get, how badly it really can affect people, especially adolescents. Yet because its mission was to compile abuse after abuse it lost its relevancy. It turned into a more depressed version of “Degrassi Junior High”. So much of the dialogue was absolutely ridiculous. It didn’t do the best job of showing everyday teens, instead it threw in a lot of archetypes. The jock who is unbelievably overpowering and cliche. The goth coffee shop girl who uses tarot cards and has impressively aggressive interactions. Need I again mention Tony and his slicked back hair and leather jacket? I’m going to get positive for the last two. I like that it delved into the mind of a victim. It showed how not only physical and sexual abuse can be emotionally damaging but how words are just as powerful. How this psychological abuse compounds and can drive someone to have suicidal thoughts. I don’t deny that someone can be brought down to the lowest of the lows. A good takeaway would be that it strives to teach people to be mindful of their actions. To remind themselves that everyone has their own cross to bear. Lastly the importance of looking for signs that someone could be suffering from depression and worse case scenario, suicidal thoughts. Suicides like Hannah’s are inherently tragic because she had a chance. There was hope for her. But my final summation is there is no hope for this show actually having redeeming enough qualities to be a positive influence for its targeted age group. I wouldn’t recommend any parent to allow their child to watch it. I don’t think most adolescents are mature enough to analyze it any deeper than its face value. We need to stop glorifying suicide and self harm. 10 times out of 10 I can guarantee anyone’s attempt to recreate Hannah’s suicide tapes will be a failed attempt to resolve anything… because it’ll be too late. 1 Comment on "13ish reasons why it went wrong"
Thank you for this! You’ve said so many of the things I have said while this much talked about series was being viewed by almost everyone in the 11-18 age group. The suicide scene was especially devastating to watch. I’m nearing my 5th decade in life, and I’ve struggled with the same feelings of depression & not “fitting in” like everyone else. I’m also a double Psychology major, & I understand what’s happening in the brain of someone who’s sufferring from mental illness. While watching her give a virtual how-to lesson on committing suicide (I would have never known to do it that way! ), I kept wondering how many kids were watching, taking notes for later. I agree that they should have offered some solutions. At the very least, let us all know that it didn’t have to end that way. The characters were shallow, yet complex, at the same time. But, they could have figured out a way to help them come to a conclusion that would have involved everyone in helping to save her, as opposed to blaming them for what was ultimately her decision. I don’t like that they didn’t give any education on mental illness or even mentnion it. We can see that Hannah was depressed. And, like you mentioned- she may have been sufferring from PTSD. But, she could also have had BiPolar disorder, based on her behavior of emotional explotions and pushing away the people she seemed to need the most. Instead, it seemed like an education on how to perfectly end one’s life and blame it on everyone else. It gave a way to justify the horrible thoughts that lead one down the road of depression & allow them to give in to the suicidal ideation. It most definitely glorrified the horrificness with none of the resolve. That’s a shame, considering the hype. Had the millions of people who watched it & identified with Hannah’s desperation been shown that it’s “normal” to have those feelings & been given a way to find help, perhaps the show would have been worth the time. Unfortunately, they completely missed the boat. Because it affected me the way it did (and I can understand the complexity of it all), I would recommend that parents don’t allow their kids to watch this, either.